The author presents a simple classification system for documenting onychocryptosis. The classification system describes the different stages of an ingrown toe nail and describes the associated treatment algorithm for each stage. The causes of onychocryptosis and the considerations for surgery are discussed. The author uses this classification system in every day practice for concise, office documentation. There have been a number of articles written on the treatment of onychocryptosis or ingrown toe nails. [1-23] It is well known that matrixectomies performed in the presence of nail border onycholysis and gross infection can lead to recurrence and poor cosmetic results. In this paper, it is the authors attempt to introduce a simple classification system to determine at what point the matrixectomy should be performed. The classification system also gives the practitioner a tool for documenting the severity of the ingrown toe nail at initial presentation. Nail procedures can be divided into two variable types 1) temporary procedures for removal of granulation tissue, offending nail, and/or skin of the offending nail border and 2) permanent destruction of a part or whole region of the nail matrix. Chemical cauterization using phenol is probably the most common permanent, partial or complete nail matrixectomy performed today. In recent years, state-of-the-art procedures such as laser and radio ablation have been described. As early as 1938, Vernon  described using electrocautery to destroy the nail matrix. Thermocautery, electroburring, cryotherapy with liquid nitrogen, aluminum nail splints and Teflon bracing have also been described in the treatment of onychocryptosis. The causes of onychocryptosis are multifactorial. It seems to affect individuals of varying ages and has no predilection to gender. Trauma appears to play a major role. This can be in the form of improper pedicures, poorly fitting shoes, cutting the nail too close to the nail folds and general trauma such as stubbing the toe or having the toe injured in sport activities. Improper cutting of the nail borders can lead to a spiculated nail. This is where a portion of the nail deep to the nail fold is imbedded into the nail groove. The nail continues to grow deep in the groove and can penetrate the distal pulp of the toe. Onychocryptosis can also occur in infants and young children. Treatment before the age of 1 year should involve symptomatic relief by simple debridement. Removal of the nail border will usually resolve the local infection. Once the infant is ambulatory or after 1 year of age, a chemical as well as sharp surgical partial matrixectomy can successfully be performed. Since nail border onychocryptosis is one of the most common podiatric conditions the physician will see in the office or clinic, a good understanding of technique is crucial to a good surgical outcome. Efforts should be made to keep the procedure simple to get the best cosmetic result. 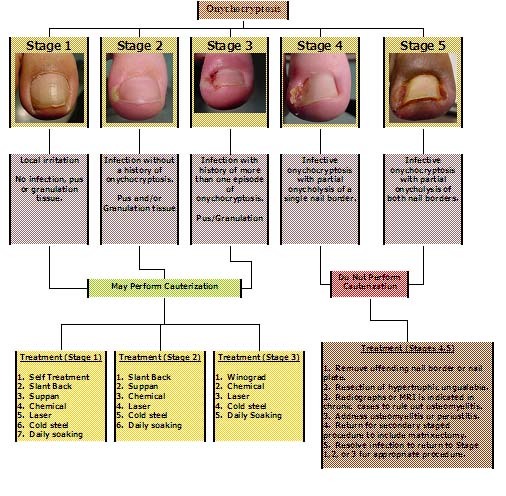 Considerations for getting the best surgical result include 1) removal of offending nail in mild cases, 2) removal of proud flesh or granular tissue from the nail border in more severe cases, 3) determination of onycholysis due to local infection, 4) overall condition and health of the nail plate, 5) prevention of traumatic onycholysis of healthy nail during the procedure and 6) proper post operative care and treatment. Other considerations of treatment should include the exclusion of nail border and bone pathology. Amelanotic melanoma, squamous cell carcinoma and other tissue pathologies have been described with associated “ingrown toenails”. Bone pathology such as osteochondromas and direct extension osteomyelitis should also be ruled out. It is important to visually and manually inspect the nail border involved. Many times, the treating physician will see varying degrees of ingrown toe nail infection. It is important to determine the extent of the infection. Is this a mild infection or is it severe? Is there granulation tissue causing the nail to loosen or lift? Is a nail spicule present or abscess? Has there been history of infection and onychocryptosis to this nail border before? These questions are important to answer before performing the nail procedure. The premise for a classification system is to address these questions and give the patient the best cosmetic and surgical result. It also gives the treating physician a plan of action that can be discussed with the patient in cases of more severe onychocryptosis that has compromised nail viability. It is well known that trying to perform a matrixectomy in the presence of onycholysis will lead to nail disfigurement and poor cosmetic results. An argument can also be made that in severe cases of infection, there is a risk of periostitis and bone infection that in most cases should be addressed before attempting a chemical or surgical matrixectomy. The risks of untreated onychocryptosis have been well documented. Simple paronychia or inflammation of the nail border, can lead to cellulitis and even periostitis or osteomyelitis of bone. Local abscesses such as a distal pulp abscess of the toe is common when the untreated nail spicule is left to penetrate the underlying distal nail groove. In severe cases of abscess and infection, simple partial and even total nail avulsions are indicated with resection of abnormal granulation tissue. Radiographs are recommended to rule out any bone involvement such as periosteal changes or osteomyelitis. Antibiotic therapy is indicated and the patient may return at a future time for a second stage matrixectomy of the nail border once the infection and inflammation has resolved. The idea for a simple classification is based primarily on the severity and presentation of initial clinical findings. Treatment protocol is primarily based on the presence of nail onycholysis or loosening of the offending nail border or nail plate. This is the most important consideration in order to attain a good cosmetic result after matrixectomy. A simple curette or probe can be used to determine the viability of the nail border after removal of the offending nail border. The author has found the use of the #62 beaver blade to be the best surgical tool to provide the least amount of trauma and risk or nail separation during nail border removal. Matrixectomy does not have to be confined strictly to chemical cauterization. The classification is useful to quickly document the severity of the condition. Figure 1 In stage 1 onychocryptosis there is a locally infected region of the nail with good nail attachment. No onycholysis of the nail border is appreciated. The hallmark of stage 1 is local irritation of the nail fold without gross infection or granulation tissue. This can be with or without a history of onychocryptosis. Figure 2 In stage 2 onychocryptosis there is increased local infection of the nail border with good nail attachment. No onycholysis of the nail border is appreciated. The hallmark of stage 2 is infection of the nail border with pus and/or granulation tissue without a history of onychocryptosis. The hallmark of this stage is infection of the nail border with pus and/or granulation tissue without a history of onychocryptosis. There may or may not be pus and/or granulation tissue. These findings differ from stage one where there is no signs of gross infection, granulation or drainage. Treatment involves removing the offending nail border surgically under local anesthesia. Granulation tissue can also be surgically excised with or without the application of silver nitrate or by Winograd resection. Sometimes, surgical removal can be attempted without anesthesia by more aggressive debridement of the nail border, but it is not recommended. The patient may or may not opt to undergo a matrixectomy. If matrixectomy is performed, the practitioner may choose to place the patient on oral antibiotics, but it is usually not required. Figure 3 In stage 3 onychocryptosis there is local granulation and/or pus of the nail border with good nail attachment. No onycholysis of the nail border is appreciated. Stage 3 differs from stage 2 by the presence of recurrent episodes of onychocryptosis to the nail border. 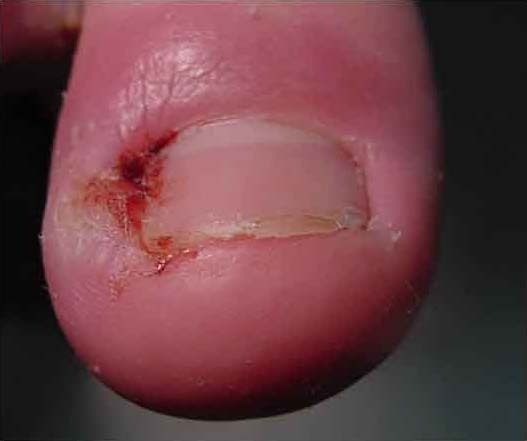 The hallmark of stage 3 is infection of the nail border with a history of more than one episode of onychocryptosis to the affected nail border. As in stage 2, the patient will usually present with granulation tissue and/or drainage to the nail fold. It is important to remember that stage 2 and stage 3 only differ by history. If this is a first episode of onychocryptosis, it is stage 2. If this is a second episode, then it is stage 3. Treatment involves surgical removal of the offending nail border and resection of granulation tissue under local anesthesia. Matrixectomy is recommended due to the history of recurrence. The procedure of choice is the Winograd procedure to remove hypertrophic granulation and provide a chemical matrixectomy. Antibiotics may or may not be used after treatment. Another important consideration of stage 3 onychocryptosis is the presence of onycholysis or loosening of the nail plate or border. A simple curette or probe can be used to identify signs of onycholysis. If there are signs of nail plate or nail border loosening, the nail is automatically classified as a stage 4 onychocryptosis. 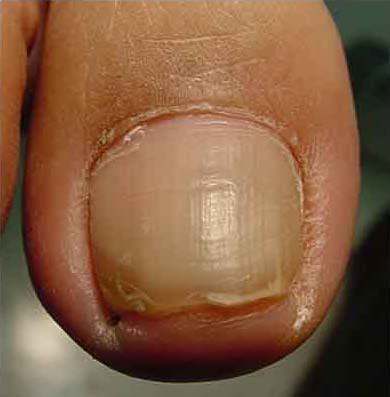 Figure 4 In stage 4 onychocryptosis there is noticeable onycholysis of the nail border. Matrixectomy of the nail border is not recommended. The hallmark of stage 4 is infective onychocryptosis with partial onycholysis of a single nail border. Interestingly, a history of previous onychocryptosis or ingrown toe nail is not a consideration in this stage. The patient typically presents with increased granulation tissue, drainage and infection to one nail border. Paronychia can present with or without granulation tissue. However, the formation of excessive granulation tissue to the nail border is the likely cause of nail border onycholysis. Chemical cauterization in this stage is not recommended. Surgical chemical matrixectomy should be avoided. It is the author’s preference to avoid any type of cauterization that will disturb the nail matrix. The patient may return for a secondary staged procedure to undergo a more permanent nail matrixectomy once the infected region is healed. The primary concern in this stage is the removal of the offending nail and granulation tissue allowing for resolution of infection without disturbing the healthy, exposed germinal matrix. Attempts at chemical cauterization in this stage will likely lead to destruction of health nail matrix and cause a poor cosmetic result. If there is any question of the nail’s integrity, a nail matrixectomy can be performed at a later time. Treatment of the underlying infection should be a primary concern and addressed with surgery and oral antibiotics. Figure 5 In stage 5 onychocryptosis there is noticeable onycholysis of both nail borders and even the nail plate. Matrixectomy is not recommended. 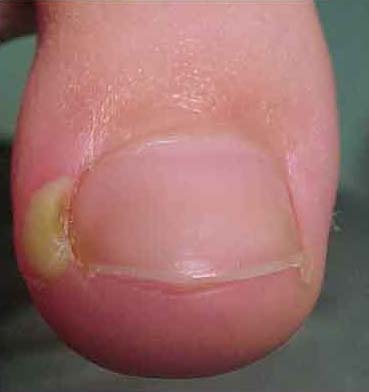 The hallmark of stage 5 is infective onychocryptosis with partial or complete onycholysis of the nail plate and/or nail involving both nail borders. This is of course the most severe type of onychocryptosis. Complete avulsion of the nail plate is recommended in order to resolve soft tissue infection. Removal and resection of granulation tissue by sharp dissection is recommended, ensuring not to disturb the germinal matrix. Radiographs are also indicated to rule out osteomyelitis in cases of chronic onychocryptosis. If there is suspicion based on history and duration of infection (i.e. ingrown toenail for 6 months to a year or more), MRI is indicated. Antibiotic treatment with daily soaks in Epsom salt is recommended. Any form of matrixectomy is strongly discouraged until the infection is resolved and a new nail is adherent to the nail bed without onycholysis. If osteomyelitis is present, intravenous antibiotics for 6 weeks are indicated with a Ceretec (white blood-cell labeled) bone scan after treatment. If osteomyelitis is aggressive with lysis of bone, surgical debridement is indicated. This classification used both clinical symptoms and presentation with nail fold measurements with staging similar to that proposed by Mozena. Both authors used the 3.0 mm nail fold depth as a measurement to when it is best to resect or reduce the ungual labial fold. Both authors also suggest that matrixectomy is indicated in the most severe stages. Unfortunately, there is no mention of what to do in cases when onycholysis of the nail may expose normal nail matrix to phenol. Our staging procedure recommends not using phenol when nail borders show onycholysis. Additionally, both of these proposed classifications do not address the risk of nail pathologies and osteomyelitis associated with chronic onychocryptosis in the algorithms. Certainly, nail dystrophy or other nail changes could alter the use of the classification. If the nail is thickened or secondarily infected with fungus, the predictability of the matrixectomy procedure will diminish. Subungual mycosis will cause structural onycholysis of the underlying nail plate not involved with the ingrown toenail. In cases of severe, chronic mycosis, onychogryphosis, onychauxis or severe pincer nail formation, complete permanent avulsion of the nail plate is recommended. Of course, if there is traumatic injury to the nail, nail avulsion and proper drainage of subungual hematoma or repair of the nail bed and/or matrix is recommended. If there is no sign of onycholysis or gross onychomycosis of the nail border and the condition is recurrent, matrixectomy using chemical phenol cauterization is the author’s procedure of choice. Proper technique is crucial to a good surgical outcome. This includes proper hemostasis using a toe tourniquet. This allows for proper cauterization of the nail matrix using pure phenol without dilutional contamination which will decrease the efficacy of the phenol. The author also uses a small #62 beaver blade to perform the matrixectomy. It is crucial to not disturb the normal nail matrix during this most important step. Larger instruments such as elevators or an English anvil nail splitter is discouraged. These instruments are too large for proper dissection of a small nail border. Once the nail is cut back to the matrix with the #62 blade, a small, straight hemostat is used to remove the nail border. Proper post operative care should include daily soaking with a hypertonic solution such as salt water or Epsom salt soaks. Rarely are antibiotics required after chemical cauterization. Although classification systems in general are purely academic, the attempt to classifying the severity of onychocryptosis may help in constructing a treatment plan of when it is safe to perform a chemical cauterization and get the best cosmetic results. The classification system can be used as a guideline to making these decisions. Certainly, variations of treatment will exist. Sometimes, even in Stage 1 and 2 onychocryptosis, the decision to perform a matrixectomy is acceptable if it is thought that there may be a risk of recurrence or if the patient desires it. Options for permanent versus temporary removal of the nail border are always an option except in stage 4 or 5. In stages 4 and 5, the primary concern should be to resolve the infection and rule out any other conditions, such as osteomyelitis in chronic cases of onychocryptosis. Matrixectomies can always be performed at a later time when the risk of the infection will not interfere with the cosmetic result. Also, performing a chemical, cold-steel, or other form of cauterization in stages 4 or 5 may cause potential risk of direct extension osteomyelitis. The variability of procedures is primarily the choice of the treating physician. There are obvious situations when leaving the matrix alone is desirable and the patient can return for future matrixectomy to prevent recurrence. The correction of ingrown toenails should be performed in order to remove an offending nail border, drain pus or remove granulation tissue and perform a permanent procedure to prevent future recurrence. Careful attention to the structure and viability of the nail plate is an important consideration to choosing these treatment options. Performing a permanent matrixectomy in the absence of onycholysis and gross infection will assure the patient the best cosmetic result. 3. Winograd, A.M. Results in Operation for ingrown Toenail, Illinoid MJ 70:197-198, 1936. 4. Frost, L. Root Resection for Incurvated Nail J Nat Assoc of Chir 40(3): 19-27, 1950. 5. Frost, L. Atraumatic Nail Avulsion with a Novel Ungual Elevator JAPA Vol 48, No. 2 , Feb, 1958. 6. Gilles, G.A. et al Periostitis associated with Phenol Matricectomies JAPMA, 76 (8), Aug 1986. 7. Kaplan, E.G. Elimination of Onychauxis by Surgery JAPA 50(2), Feb 1960. 8. Gottlieb, M.M. The Permanent Removal of Nails by Evulsion and Chemical Cauterization, Current Chiropody, August , 1953. 9. Boll, Otto F. Surgical Correction of Ingrowing Nails, J Nat Assoc of Chir; Presented before the March 1945 meeting of the American society of Foot Surgeons. 10. Suppan RJ, Ritchlin JD: A Non Debilitating Surgical Procedure for “Ingrown toenail”. J Am Podiatry Assoc 52 (11) :900,1962. 11. Sadhu, S., Bhat , K. Ingrown Toenail: Results of Surgical Matrixectomy JK Science 6(3), July-Sept ,2004. 12. Emmert, C. Operations for Ingrown Nail, Arch. F. Klin. Arch. 11:268-277,1869. 13. Michaelis, H.J. Ingrown Nails J.D. Chir. U. Augenh. 14:234-255, 1830. 14. Heifetz, C.F. Operative management of Ingrown Toenail, J Missouri M.A. 213-216, April 1945. 15. Clarke, B.G. Dillanger, K.A. Surgical Treatment of Ingrown Nail, Surgery, 919-924, June, 1947. 16. Wilson, T.E. The Treatment of Ingrowing Toenails, MJ Australia, 2:33, July, 1944. 17. Nuttall, H.C.W. Ingrowing Toenail, Lancet 2:100, July 1941. 18. Keyes, E.L. The Surgical Treatment of Ingrown Toenails JAMA 102:1458-1460, 1934. 19. Barlett, R.W. A Conservative Operation for the Cure of So-called Ingrown Toenail JAMA 1257-1258, April , 1937. 20. Linch, A.O. Treatment of Ingrown Toenails, The Southern Surgeon, 173-174, 1939. 21. Cox, HA. Direct Extension Osteomyelitis Secondary to Chronic Onychocryptosis. Three case reports JAPMA 85 (6), 321-24, 1995. 22. Mozena, J.D. The Mozena Classification System and Treatment Algorithm for Ingrown Hallux Nails. JAPMA 92 (3), 131-35, 2002. 23. Martinez-Nova, A. et al. A New Onychocryptosis Classification and Treatment Plan. JAPMA 97 (5), 389-93, 2007. This entry was posted in Uncategorized and tagged Ingrown toenails, Onychocryptosis. Bookmark the permalink.